Eric Holder should be facing perjury charges and who knows, maybe he will before it’s all said and done. Still, it’s at least good to see Republican Congressmen publicly throwing down the gauntlet over Eric Holder’s lies under oath. House Republicans, in a lengthy report on the Justice Department’s leak investigations, formally accused Attorney General Eric Holder of misleading Congress with “deceptive” testimony that he knew nothing of the “potential prosecution” of the press. The 70-page report was released late Wednesday by Republicans on the House Judiciary Committee. To coincide with the release, lawmakers also wrote a letter to President Obama calling for a “change in leadership” at the Justice Department. Eric Holder has no honor, no decency, and lying comes as easy as breathing to him. 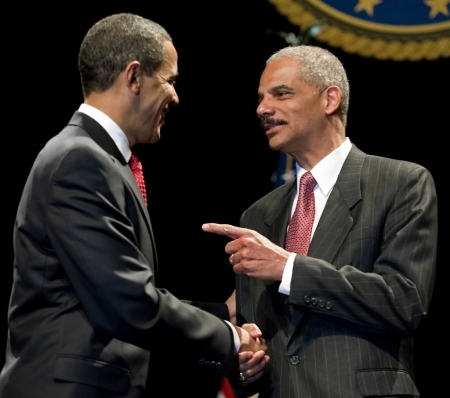 Essentially, Holder is just as crooked as the sort of criminals that the Department of Justice goes after and he would have been fired half a dozen times over already if Obama wasn’t just as bad.